Office: the office is normally open from 8-12am Monday through Friday, although there are often people there throughout the day. We are normally closed on major holidays, and the day after Christmas and Easter. 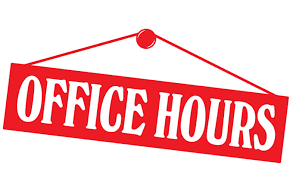 Rector: the Rector's standard office hours are normally 9-12 Monday through Thursday, except on major holidays and the day after Christmas and Easter. He is also available by appointment.